Sometimes you need to sort out a set of events. What happened first? Then what took place? At other times, you need to understand the steps for doing something. Where do I begin? What do I do next? A time line can help. 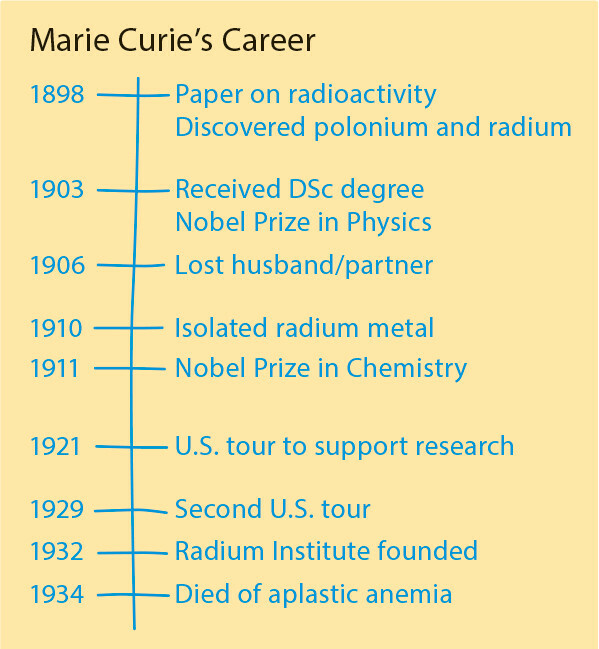 This time line helped one student sort out the events in Madame Curie's life of discovery. The student first made the time line to prepare for a report about her but then actually included the time line as a visual element in her report. Your Turn Create your own time line to analyze a topic that has a series of events or a set of steps. Read below about how to create a handmade time line. You can also download the time line template at the bottom of this minilesson. Research your topic and note important events or steps. Write your topic at the top of a piece of paper. Draw a vertical line on the left side of the page. On the right side of the time line, write down the details in the order that they occurred. On the left side of the time line, write dates, numbers (1, 2, 3, 4 . . .), or words like "First," "Next," and "Then." Sequencing with a Time Line by Thoughtful Learning is licensed under a Creative Commons Attribution-NonCommercial-ShareAlike 4.0 International License. Based on a work at k12.thoughtfullearning.com/minilesson/sequencing-time-line. From the blog post "7 Graphic Organizers for Critical Thinking"